Here’s an update on a Nigerian classic: Stir-fried Jollof rice. And this isn’t to buck tradition – this is about how travel shapes who we are, opens up our eyes to new possibilities and redefines our boundaries. 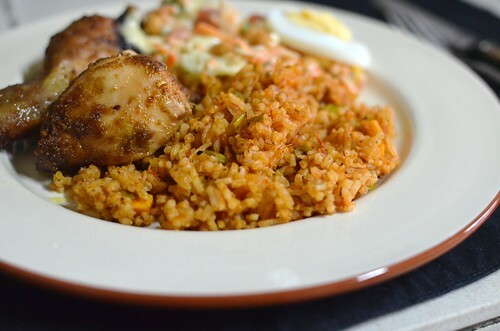 For Nigerian Jollof is typically ‘stewed’, not stir-fried or oven-baked. Right now, Nigerians the world over are planning their Christmas meals, and clothes. They are wondering how they’ll spice the fried chicken, and how the Jollof (rice) must have that ‘smoky’ flavour, thanks to socarrat, or bottom pot as we call it in Nigeria. They have also picked out special clothes and shoes for the day. The children especially. Jollof rice is made for everyday, but especially for Christmas Day. 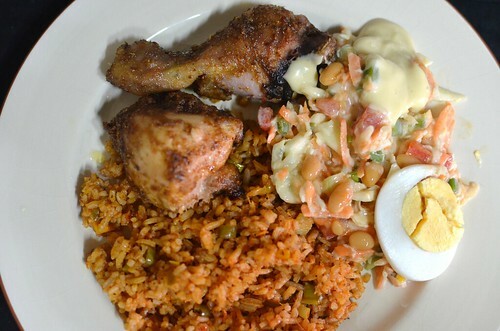 Along with Fried chicken and beef and ‘Nigerian salad’ – a coleslaw type salad. Spicebaby says: ‘For those who are not familiar with the term, BOTTOM POT is that last few spoonfuls of food still left at the ‘bottom of the pan’ which you may have to scrape into your own plate after everyone else is served. See, in order to get a well-cooked pot of certain meals, the contents of the bottom of the saucepan may sometimes get overcooked and in some cases, get near burnt. This usually does not necessary mean the entire pot is inedible as the ‘damage’ is only done to just the last layer of food. 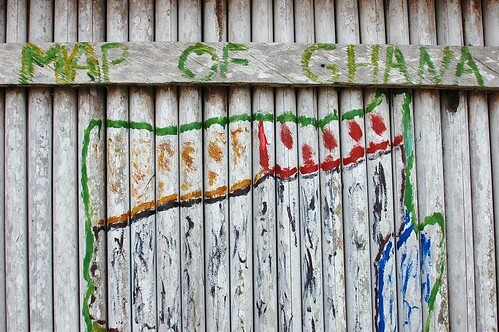 But first I say, to Ghana, to Ghana, to the Spaniard too. 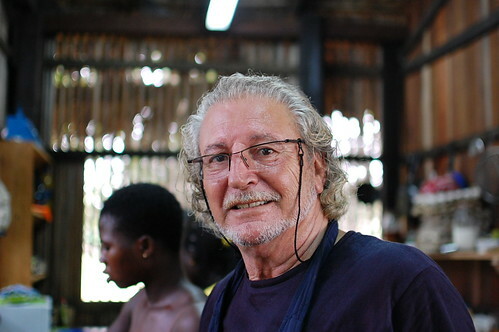 To the inspiration for this post and the inspiration for the way I now cook Jollof rice. 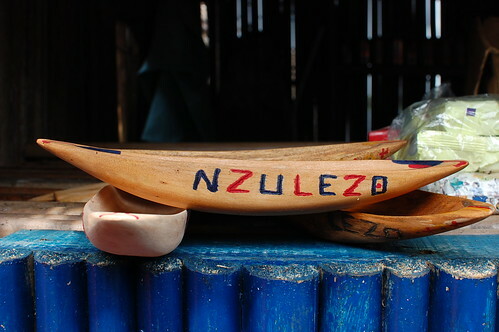 Nzulezo, the village on stilts where boats are the cars, and water, the highways. 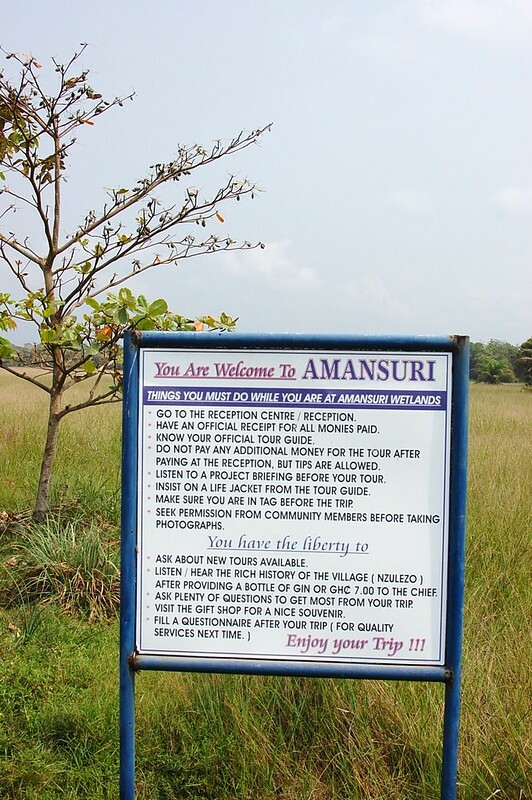 Its almost a year since we spent Christmas and New Year in Ghana. I say one has to go to the banks of Lake Tadane, in the Amansuri wetlands of Ghana’s Western region where the spectacular scenery includes stretches of water, filled with lily pads and leaf arches, a stilt-propped water settlement of Nzulezo, nominated as a UNESCO World Heritage Site and Cafe Puerto, a delightful Spanish establishment to eat the best Jollof rice ever. 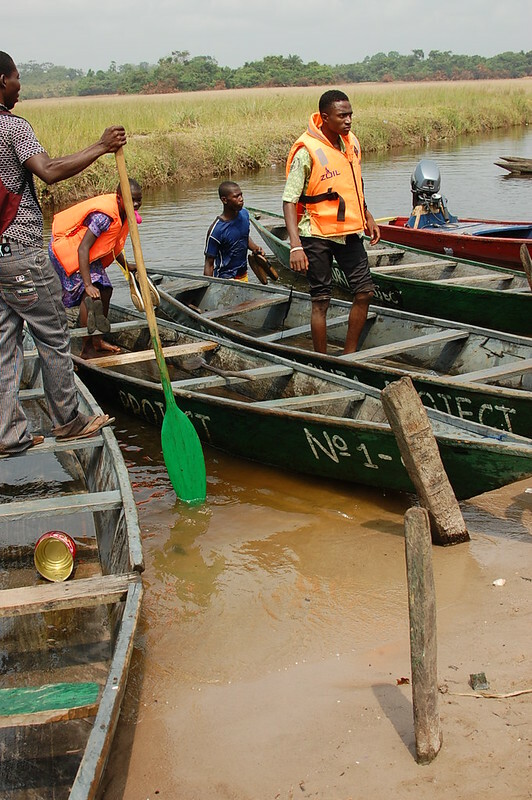 But first, one must row in a dug-out canoe for over an hour in calm waters, waving to other canoers and scooping water out of the canoe’s belly. or bottom. 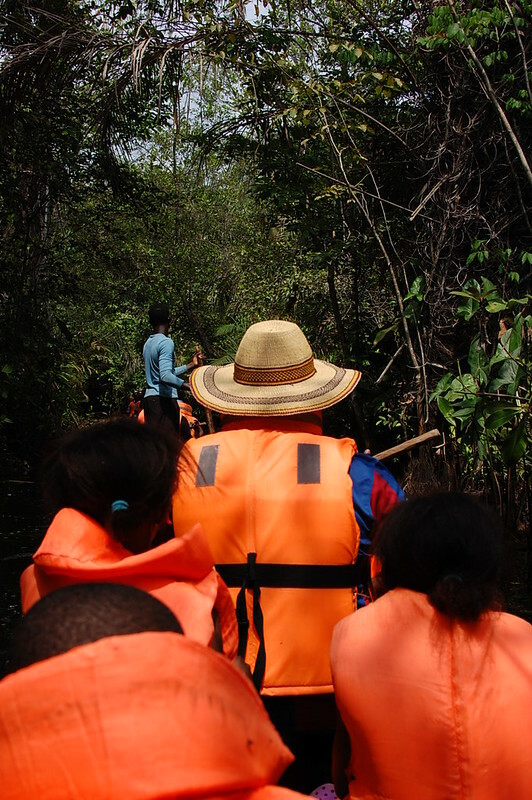 My husband in the raffia hat, and the family behind him, rowing away…. 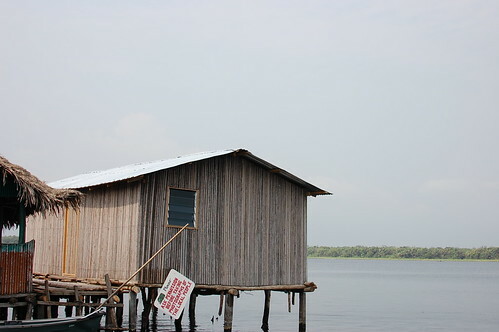 One will walk in a village, raised on stilts and one will see kitchens and schools and a delightful map of Ghana. One will hunger for dry land, and for food. I am going to start a collection of ‘maps’! 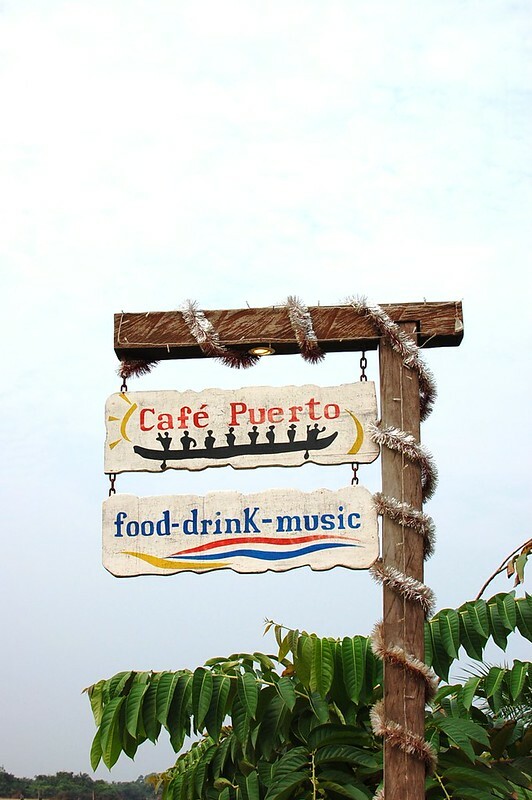 ….and ushered into the kitchen while the orders of Lobster Paella, Jollof rice and potatoes are prepared. One will eat a paella so delicious, enough to rival that of Barcelona, and La Rambla. But delicious as the paella will be, menu envy will reach fever-pitch when the Jollof rice appears. 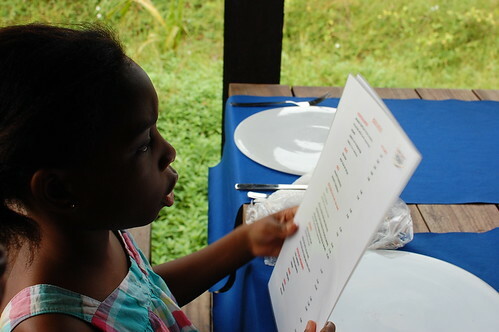 Sensible daughter pondering the menu choices, finally settling on the award-winning Jollof rice! Two hours of paddling and an hour of walking on water has emptied out 5 bellies to various degrees. My camera too dies, shortly before the Jollof rice arrives. I will never capture the visual goodness that it is. Was. 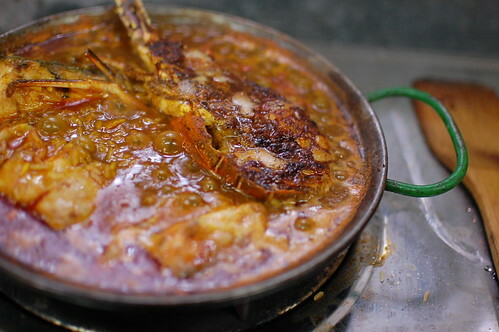 Even if I will capture that of great paella, flavourful with lobster and the most tender and juicy pieces of fresh fish. The dish is stir-fried, as opposed to ‘stewed’. This is the BIG revelation, and we all work it out together, my husband, the children and I. 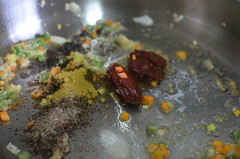 The spices however are trickier to remember. But we’ve been in Ghana long enough for me to know that they have ‘base/mother seasonings’ which include green chilies, fresh ginger and onions. 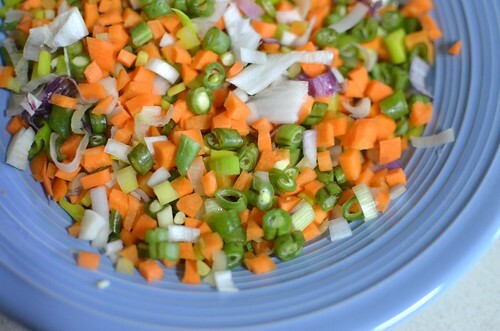 There are finely chopped vegetables in the rice – spring onions, carrots, green beans (I think), similar to Chinese fried rice, and not just as a garnish. This memory stays with me and shapes the way I cook Jollof till this day. I can cook it to taste – my husband for instance likes his rice ‘saucier’, a cross between regular jollof and paella and this means I can make him a perfect batch. And most importantly, I don’t need vegetable or chicken stock to impart flavour! In Nigeria, I make all my stocks from scratch as jars and cartons of stock aren’t readily available. Stock cubes are very popular in Nigeria with Maggi and Knorr being the largest brands. Both make beef and chicken cubes as well as a host of other products. An interesting fact to note is that these cubes are used as seasoning, and as spices as opposed to forming the base for liquid stocks. So we use them as one would curry powder or ground fennel seeds. To taste. There are essentially 3 steps to making the Jollof rice: Cook the rice, prepare the vegetables and tomato sauce and stir-fry. Thai Jasmine rice is my favourite for its sweetness and scent, followed by Basmati, and then long-grain. 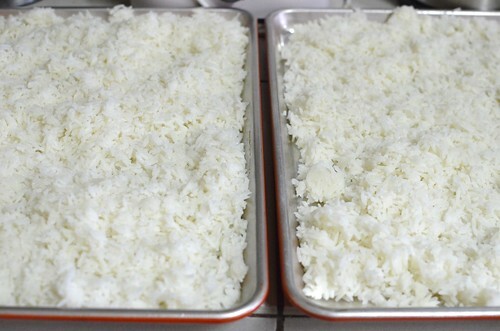 I make a huge batch of rice and then freeze in small containers for lunches and dinners. 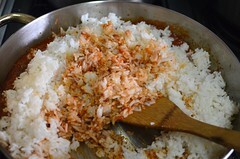 You will fry the rice in 4 – 5 batches, each time using the ingredients listed. i like to combine all the batches in a large pot, simmer for a few minutes to unify the flavours of the different batches before serving. 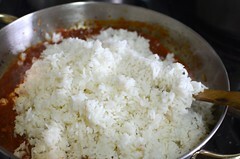 In a large pot, combine the rice with the boiling water and a teaspoon of salt, and let cook on medium – high heat for 5 minutes. As you will season the rice during stir-frying, you do not want to ver-salt it at this stage. 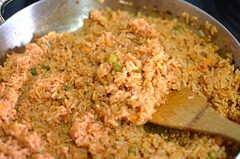 Stir and turn the heat down to a simmer, for 10 minutes till the rice is a touch cooked and the water is absorbed. You do not want the rice to be cooked through. Take of heat, let sit undisturbed for 5 minutes then spread on a tray (or two) to cool. Put it by an open window or a fan or pop the trays in the fridge or deep freezer till cold. This will allow the rice keep its structure and not turn mushy during the stir-frying process. Blend chopped tomatoes, onions, chillies with some water or stock till fairly smooth. Set aside, or keep covered and refrigerated for up to 4 days, frozen for up to 3 months, till ready to use. To prepare vegetables, finely chop carrots, green beans, spring onions and combine, except the green spring onions. This will form the vegetable medley for the stir-fry. Keep a large pot handy on the stovetop where all the batches of the rice will go in to, for a final stir and simmer once you’re done, if you like. Alternatively serve from pan to plate. To fry a batch: heat up a large pan with 2 tablespoons of cooking oil. To this, add 1/4 cup of vegetables, 1 – 2 teaspoons of the ginger-garlic paste, 1 teaspoon each curry powder and dried thyme, 1 Maggi stock cube, 2 teaspoons of tomato puree and a pinch of salt. Stir fry for a minute, then add 3/4 – 1 cup of the blended tomato mixture. Check for seasoning and adjust to taste. 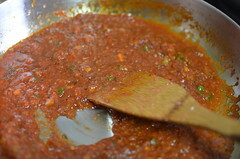 Allow the sauce to cook for 2 – 3 minutes, stirring continuously so the bottom doesn’t burn (too much). Add 4 cups of rice and stir. Stir, from the bottom up, to the centre, pulling in the rice till the grains are coated and coloured orange.Allow to cook for 2-3 minutes. Check again for seasoning and adjust. Add the green spring onions, stir to combine and turn out into the large pot, on stand-by. 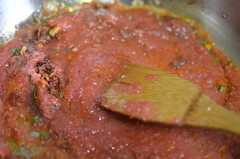 Repeat this process for the other batches, till rice, tomato mixture and vegetables are used up. Finally, heat up the cooked rice on low heat, stirring gently, for about 10 minutes. Serve with (Suya) oven/fried chicken and a Nigerian Salad (recipe coming up in the next post). Thank you Ghana. And Spain. 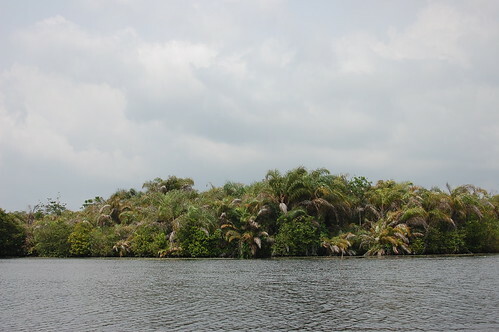 The village of Nzulezo is located near the village of Beyin, roughly 90 kilometers west of Takoradi, in the Jomoro District of the Western Region of Ghana.